An engine is designed to contain burning fuel within the cylinder, so what can fuel do that is so detrimental to an internal combustion engine? The simple answer is quite a lot of damage that is normally easily avoidable. Several months ago we came across a recently reconditioned, 16 valve Mitsubishi diesel engine with symptoms of rough running and bad starting. The driver reported that it was running very similar to the engine that had failed not long before. After a few checks we decided to remove the cylinder head to help with the investigation. 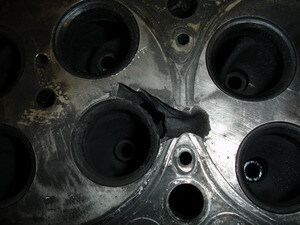 As soon as the cylinder head was removed structural damage in the aluminium casting was obvious. As you can see on the photo it is evident that localised burning has occurred between the two cylinders originating in the cylinder on the left and burning through to the right side. 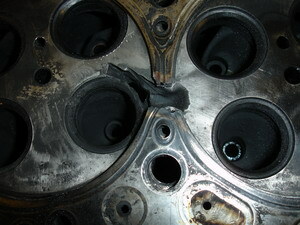 The Multi Layer Steel (MLS) Head Gasket had also suffered major damage. Something had been burning very hot in the area. A quick check of the injector by a diesel specialist confirmed our deductions that there was a bad spray pattern on the injector on that particular cylinder. When you fit a replacement engine please get the injectors tested; in this instance a few pounds spent before fitting would have saved the cost of another expensive reconditioned engine!